I made another shirt! I’m not sure which is better; having the time to make all these work clothes, or going to work to wear them. There are times, like now, when maybe I would prefer the latter. I am searching for contracts in the morning, and sewing in the afternoon these days. I bought the fabric at the show at the NEC last Friday. I have at least enough fabric for 2 shirts, and there is an interesting pattern in the post somewhere, but in the meantime, I made this one exactly the same as the white one and the paisley one, previously blogged. It always useful making the same pattern twice in close succession, because you can remember how to make it, apply any lessons learnt and apply short cuts, if there are any. The fabric was beautifully crisp when I bought it, but its now been washed twice, and is less crisp. Its not that easy to iron. Maybe Paul Smith shirt purchasers take them for someone else to wash and iron them! As with the white one, I didn’t want the buttons to be a feature, and in fact, I bought the same, 8p per button variety, from the market, but in a pale blue, plus enough for the rest of the fabric, when the pattern arrives. My only other comment is that I have now done another 12 button holes (2 tests and 10 on the garment) and there have still been no further problems. So easy when it works properly! 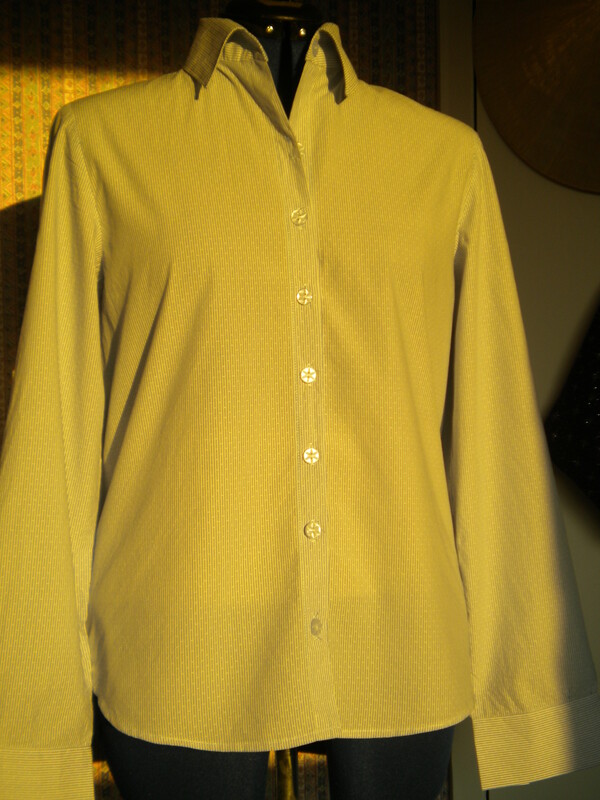 This entry was posted on March 25, 2015 by ann hebden in Blouses, Butterick, Fashion, Sewing, Shirt and tagged Butterick, Fashion, Handmade, Sewing, Shirt.